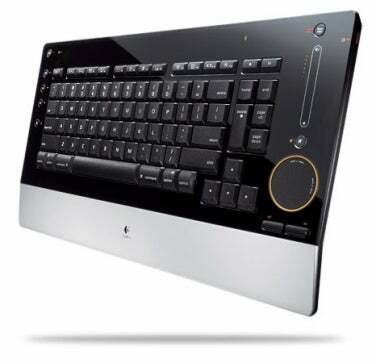 Ever since Logitech released the Windows-only diNovo Edge keyboard, back in 2006, many Mac users have wished for a Mac version. Sporting great key feel, lots of special features, and a beautiful design, it was a drool-worthy input device—and, at $200, came with a jaw-dropping price to match. Two years later, Mac users finally got their wish. Thankfully, the diNovo Edge Mac Edition is just as much of a standout keyboard. And get this: at $160, the Mac Edition is actually $20 cheaper than the current price of the Windows version. (You can thank Apple for including Bluetooth in every shipping Mac for that one; Windows users pay for an included USB Bluetooth adapter.) And while it’s still expensive, if you spend hours each day using your keyboard, the Edge may well be worth its premium price. Let’s get this out of the way: The diNovo Edge for Mac has no numeric keypad. If you absolutely need a keypad—and judging from the reaction to Apple’s Wireless Keyboard when it was released, quite a few people feel they do—this isn’t the keyboard for you. But if you don’t need a numeric keypad, read on, because Logitech’s latest Mac offering is quite compelling. At just over 16 inches wide and 8.4 inches deep, the diNovo Edge is considerably larger than Apple’s own Bluetooth keyboard, but far more functional, thanks to a number of special-function buttons as well as a unique, circular touchpad Logitech calls a TouchDisc. Just over 1.5 inches in diameter and located in the lower right corner of the keyboard, this touchpad serves dual purposes. First, if you move your fingertip across it, the touchpad works much like a laptop’s trackpad, moving the mouse cursor across the screen. Two tactile buttons below the touchpad serve as left- and right-click, respectively. There’s also a cursor button on the left edge of the keyboard that serves as a second left-click button. The touchpad’s circular shape stems from the pad’s second purpose: scrolling. If you place your fingertip on the tiny nub at the top of the circle and then move your finger around the outer edge of the pad, the active window will scroll horizontally—to the right if you’re moving your finger clockwise, to the left if you’re moving it counter-clockwise. If you start at the nub on the right-hand side of the touchpad, the window will scroll up (if you move counter-clockwise) or down (if you move clockwise). The faster you move your finger around the ring, the faster you scroll. Once you get the hang of this scrolling feature, it works well. You can control the acceleration of scrolling, as well as the tracking speed for mouse-cursor control, using the Logitech driver software (discussed below). A tactile ring around the touchpad glows amber to indicate that the pad is detecting input. You can also disable the touchpad completely by pressing the left mouse button and the Fn (function, not to be confused with F1, F2, etc.) key together; this also disables the other touch-sensitive controls, noted below. Speaking of ergonomics, it’s also worth noting that by omitting a numeric keypad, the diNovo Edge lets right-handers place their mouse, trackpad, or tablet much closer to the main area of the keyboard, reducing the reach required to use those devices. Keyboards generally use either of two types of keys. Dome-style keys, traditionally found on desktop keyboards, are relatively thick and require a good amount of travel (the distance the key must move to be recognized as a keystroke). Scissor-style keys, found on most laptops and on a growing number of desktop keyboards, offer a lower profile and require less travel (and, often, less force), but often lack a good tactile feel. The diNovo Edge’s keys are a unique hybrid: they have scissor-style mechanisms, but they’re a bit thicker, and require a bit more travel, than most laptop keys. Logitech calls this technology PerfectStroke. Whatever the marketing name, the diNovo Edge’s keys are among the best I’ve used. There’s absolutely no mushiness; instead, you get a near-perfect amount of initial resistance and just the right amount of travel. And the slightly concave key tops help touch typists keep their fingers on the correct keys. The key layout is also very good. The main area of the keyboard provides a standard layout with true Mac modifier keys (Control, Option, and Command) in their proper locations. The one minor tweak is that the inverted-T set of arrow keys is shifted a bit to the left compared to Apple’s full-size keyboards, due to the position of the Edge’s touchpad; as a result, the right-hand modifier keys are shifted a bit to the left, as well. However, I didn’t find this to be an issue, even while touch-typing. I also like that Logitech has made the modifier keys and space bar slightly thicker than the other keys; this makes the modifier keys and space bar easier to press, especially when contorting your hands to execute various keyboard shortcuts. The function keys (F-keys, F1 through F12) are also properly arranged—separated from the top row of numeral keys and arranged in groups of four. Far too many keyboards these days (Apple, are you listening?) jam the F-keys into a solid row, flush against the top row of the main keyboard area. Above the arrow keys is the traditional Home/End/Page Up/Page Down/Delete pod. Missing is a Help button—a welcome omission, in my opinion, as it’s rarely used and often hit accidentally. As a result, the Delete key is twice as large as the others, making it easier to press quickly. On the other hand, I’m not a fan of the non-standard position of the Home key above the Delete key.